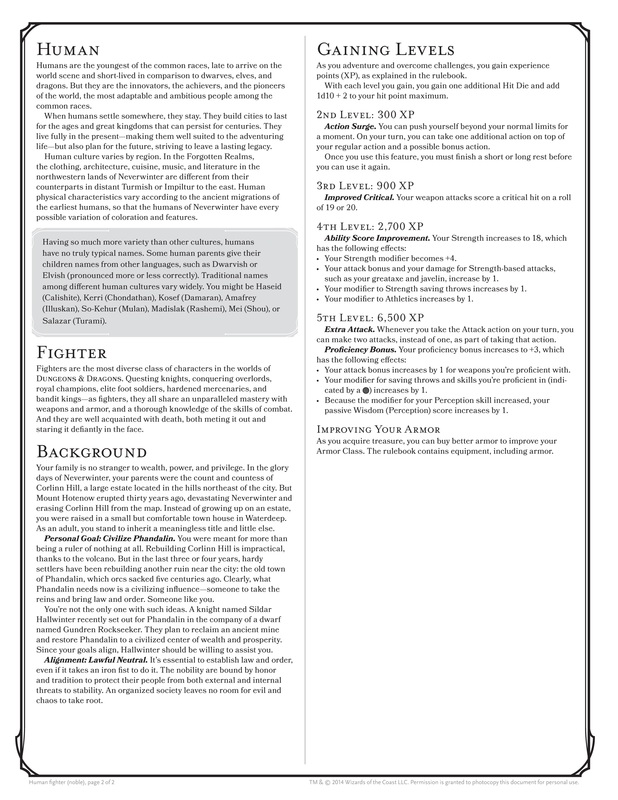 Dungeons & Dragons Fifth Edition will place key character stats and roleplaying information on a single, easy-to-reference page. 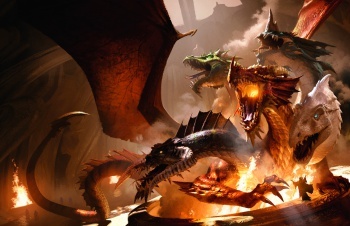 Original Story:Dungeons and Dragons Fifth Edition will be available to players in less than a month, so Wizards of the Coast is naturally revealing details of what players can expect. 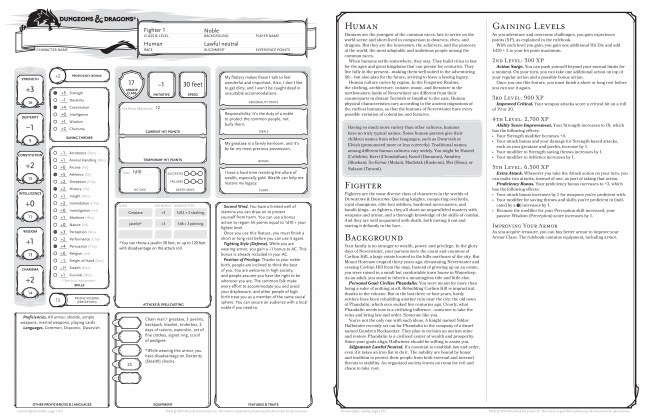 Perhaps one of the most important factors is the character sheet itself, which must relay essential information to players in a way that doesn't overwhelm them with rules and numbers. This is easier said than done given D&D's traditional number crunching, but Wizards seems now seems to be taking a very streamlined approach. Not only can new players quickly access to relevant stats, there's room for D&D's generated personality traits, character backgrounds, and other key roleplaying mechanics. Attributes, skills, and saving throws have all been condensed into a single column on a single page, which is great for starting players. Weapons and equipment space is a little smaller than previous editions, sharing a column with armor and hit points. Still, these sections were always the first to expand into "treasure chests" on additional sheets, so we can probably let it slide. Generated personality traits also have their home on the same page, which means most in-game statistics and roleplaying behaviors can be reviewed at a glance. 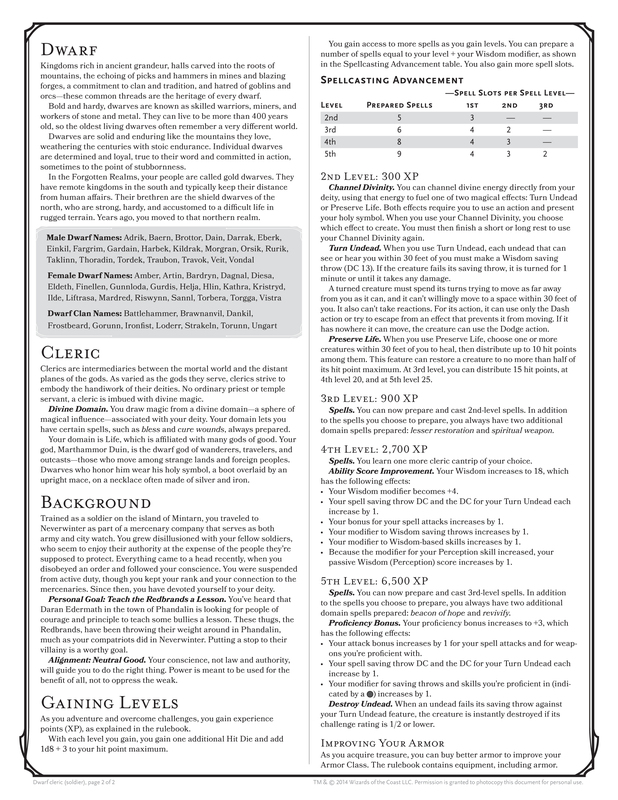 The second page is a text wall by comparison, but a useful one detailing race, class, character background, and most importantly, leveling bonuses gained when leveling up. Ideally this will help group leveling proceed quickly when it occurs while providing an easy reference to level-specific traits. To be fair, this provided sample is only for a pre-generated human fighter class, and may be altered in the finished game or for other character types. At the same time, the streamlined focus seen here so far should go a long way towards adjusting players to the 5th edition, helping players get to the action faster than previous books have. We'll have to wait until July 15th to see how it works in play, but at least now we have a better sense of how characters will "look" in a tabletop sense. 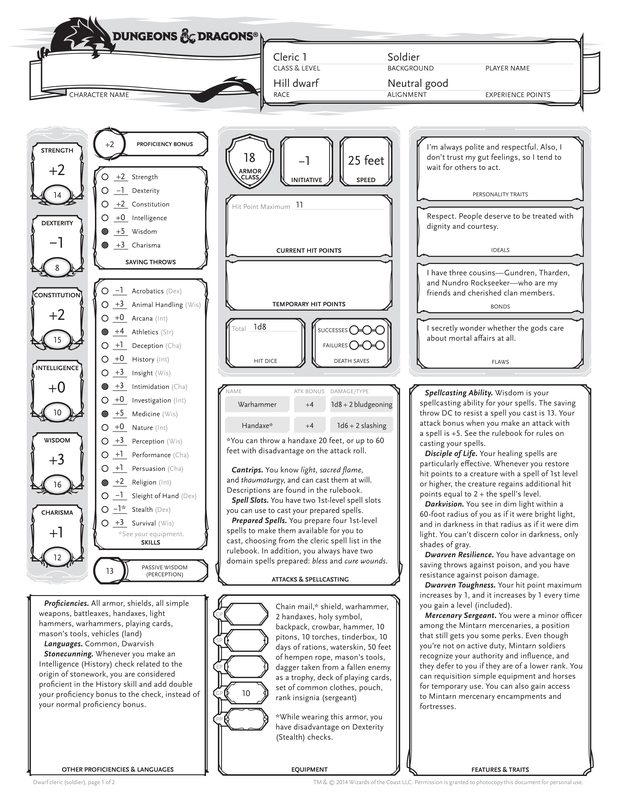 Update: Last week's character sheet gave us a look at a Human Fighter, but that's only one possible Dungeons & Dragons build. 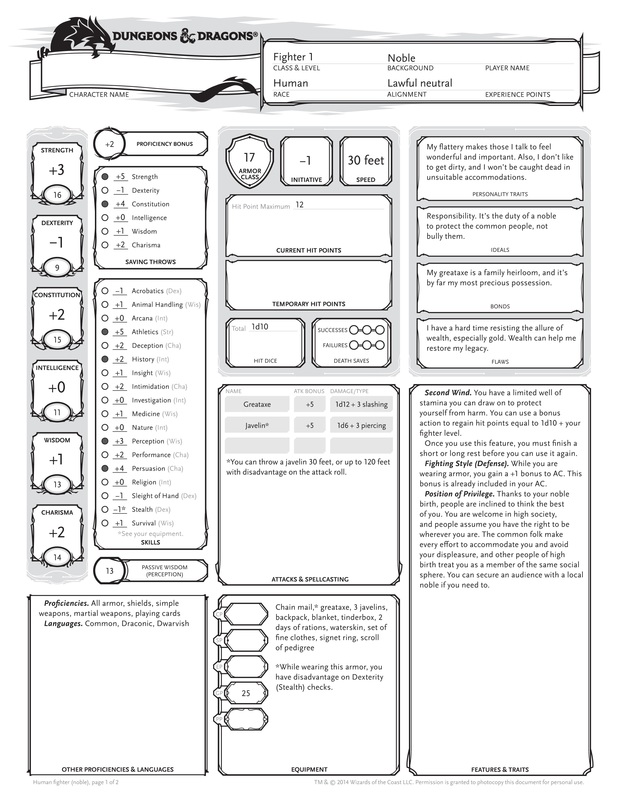 Next up is a Dwarven Cleric, highlighting a few of the race's Fifth Edition stats and spellcasting abilities. Presumably additional sheets are on the way, covering races like elves, halfings, and orcs, not to mention other magic-using classes.